From the front of my house, sitting in my driveway--say in a car--my garage looks like any other garage. Two sets of three paneled framed squares, one row sitting on top of the other, above that, three rectangular windows, (perhaps a little dirty), paint flecked by rain, wind, weather and wear, but an ordinary garage no less. However if you were inside standing under the complicated mechanism that automatically pulls up and lowers the heavy door-you would notice that the inner workings are damaged. The chain that once lined the intricate pulley system dangles dangerously. The frame that houses the thick cables shakes and rattles, and is precariously connected to the walls and ceiling. The plastic encased motor chokes and sputters. Truth be told, the automatic garage system is in such disrepair that we have been unable to use it for over a year, and in the spirit of full disclosure you can't even open our garage door the old fashioned way. It refuses to stay up on its own and will violently slam down if no one holds it. It actually once snapped a two by four in half that my husband had used to prop it up in order to sweep out debris last spring. Yet not a person driving by our home would know any of this unless they were allowed inside. Even then they might not realize that the garage was broken unless they pushed the absolutely ineffective button that is supposed to raise and lower it. Where am I going with this? Good question. Where AM I going with this? This afternoon when I drove up my driveway and parked in front of the debunked garage I was feeling a little overwhelmed, a little haggard, a little on the edge, and it dawned on me that my garage was very much like me, and many other moms (and dads) that I know. Our facade is strong. The face we show to the public is together. We're perhaps a little older but we dress for success, speak the language of sanity, laugh when others around us laugh, and lend a hand when needed. We are serious about our careers, take the kids to the doctors, buy nutritious groceries, cheer at sporting events and wave hello and good bye to acquaintances. We try our best to blend in, to keep the waters smooth, to look like--well--an ordinary garage door. On the outside we are cool customers...on the outside. But then there's the inside, the part of our lives that only a few are privy to. Away from the eyes of the public we might find that our complicated mechanisms, our inner workings, are damaged. Our chains may be dangling (some lower than others...sigh.) Our frames may be precariously connected. Our motors might be coughing and sputtering. We may even have moments in which we need to be propped up by the support of our loved ones. If that doesn't happen we could violently crash--breaking two by fours in our wake. Gratefully, we are relieved that these malfunctions of humanity can remain hidden so that the public-at-large knows us only by what we allow them to see. But how would we all feel if those damaged inner workings were somehow exposed to the prying eyes of the public? Recently our small community has had an inordinate amount of what the gossip mill would call "scandalous behavior." Highly esteemed members making what seem to be unimaginable choices: Doctors, teachers, architects, school board members caught cheating on spouses, esteemed families experiencing public breakdowns, high school sweethearts--couples who seemed bonded forever by the sheer strength of heart and mind--divorcing. Although each recent tragedy is fundamentally different and unique there are two things that they all have in common. First, as with all scandals, stories are passed from community member to community member; some true, some exaggerated, some completely fabricated but all readily believed by the listeners. These stories fly through the air as easily as feathers in a wind storm and echo like footsteps in a narrow hallway. Secondly, and perhaps more importantly, according to the "gossip elite" these "scandals" are scurrilous and shocking because of the very nature of WHO was involved. For the last few weeks, many shook their heads in disbelief saying things like, "I never thought that SHE would do something like that!" or "Can you believe that THEY are divorcing!" or "They SEEMED like such good parents." So these are the newest casualties of the small town gossip mill. Their garage doors are wide open and all the world gets to look inside and tsk at the disrepair. A people watcher at heart, it is always interesting to me how people react to such disrepute. Some will have no sympathy, needing a ladder to climb on their horses, they will shake their heads and say, "Well all poor choices have consequences." Some, helpers at heart, will chime in with recommendations as to how "the broken garage" could be fixed. Some will judge that the owners of our figurative garage didn't try to repair it the first moment that they noticed something just wasn't quite right. Some will vow never to visit the house with the faulty garage again. After all, a broken garage can be a dangerous thing. 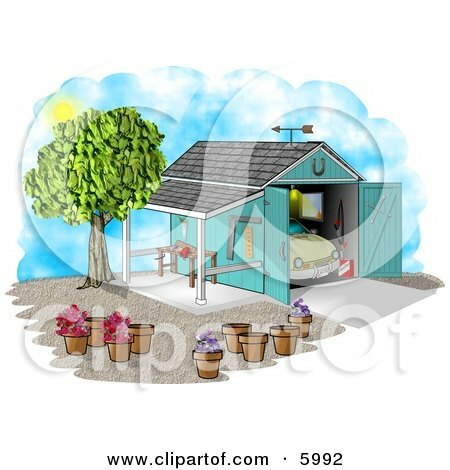 Some will be gleeful that the perfect looking house isn't so perfect after all...But hopefully...hopefully...a few will call or visit and say, "My garage door was once in disrepair. What do you need from me?" Or maybe even, "My garage is fine but my dishwasher doesn't work. How can I help you fix that garage so that then maybe you can help me repair my dishwasher?" When the seemingly sane and put-together do something insane and unraveled, we shouldn't be shocked. The human being is a complicated mechanism. Lucky are those who haven't had a complete and public "mechanical breakdown" for all to witness, but I'd wager that most of us have had many-a-mechanical malfunction--behind very firmly closed garage doors. Beautifully stated, Logan. And just for the record, my Suburban back gate AND my dishwasher door are broken. Oh, we all have those malfunctions, all right! Some people are better at looking perfect on the outside than others, but we all have things we'd rather were not transparent to the world. While I understand privacy, I also know that there are some that are over-the-top public with things, too. It is unfortunate that many spend so much time judging others for his or her imperfections rather than reaching out in support. Being a teacher, I am sure that you are more than aware how much we are in the public eye. Small town life is never dull, but no one likes to be the topic of negative conversation either! I loved your whole analogy. I wish people could just be more accepting of people being real and imperfect. One of my favorites...by far. Another wonderfully written story...and so truthful...we have all had a few broken garage doors. i understand it, great comparison, even though my garage doors work doesnt mean everything is fine. Hope nobody notices! People hear the stories and are stunned. they feel need to find a friend to help figure it out and it not even ABOUT THEM! It is wrong but sometimes girls look at that to not look in their garage! Thanks for writing this, Logan. I firmly believe that we all have our share of broken garage doors. Nothing upsets me more than when people forget to reach out and lend a helping hand. After all, we're all human. Your blog is, in many ways, an educational tool...I wish it were a column in the paper for all to read! Logan gets it...life.. and how hard it can be... and what it feels like to be broken. And she puts it into words so well!! Don't just leave your garage door open so you can avoid certain problems. Thanks for that info. Leaving the garage door or even the windows open is an invitation for theft. I'm glad you have the garage door fixed. Thank you very much for sharing this article, I found it really funny.